Parcel Hero is a United Kingdom based delivery company that partners with large logistics companies to bring you cheaper prices on your next goods pick up and delivery. 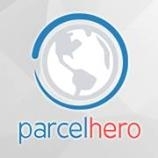 ParcelHero services include domestic United Kingdom parcel delivery that under certain conditions can be more cost effective than the post office. International package delivery to more than 220 Countries across Africa, Asia, Europe, North and South America, Australia, New Zealand. Insurance is available for your next goods delivery. Not just small parcels, large odd shaped items can be delivered. You may need to call us and let us know any extra details about the size and shape of your items so that we can send the correct vehicle.